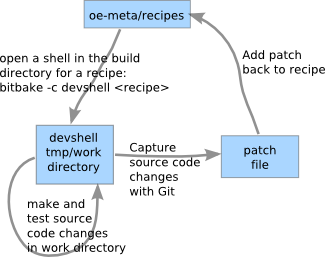 One task that is a often confusing to new OpenEmbedded users is how to capture changes to the source code for a package/recipe. First, lets review the progression in tools use to capture source code changes. 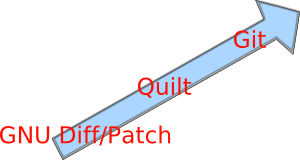 Once your source code is in git, then you can do all kinds of fancy things like merging, re-ordering, and re-naming patch files with the git-rebase –interactive command. increment the PR variable so that bitbake knows to rebuild the recipe. Figure 2 illustrates the above steps. While the above steps might seem overly complex, you must consider what you are trying to do. Building a Linux distribution is not a simple task. We are dealing with large amounts of source code from many different projects. Putting all this source code in one tree is not an option, because then we would be defeating the very reasons open source is attractive in the first place: flexibility, largly decoupled projects, advanced technology, fast bug fixes, many options to choose from, developer support, etc. Each open source project must remain a self contained project that is largly decoupled from other projects so it can develop at its own pace. It is for these reasons that open source technologies are used to give products a competitive edge. So, like any complex process or task, there must be some understanding of how it works, an appreciation for what it can do for you, and an investment in tools and techniques required to be effective. could please do a link inside the oe wiki. That would help new users a lot. And the –interactive option is useful even with the git-add command. Microcontroller (MCU) or Microprocessor (MPU)? BEC Systems, Proudly powered by WordPress.